Camp Las Casas was a United States military installation established in Santurce, Puerto Rico in 1904. The camp was the main training base of the "Porto Rico Regiment of Infantry," [note 1] a segregated U.S. Army Regiment which was later renamed the "65th Infantry Regiment." The base continued in operation until 1946, when it was finally closed. Location of Las Casas area in Santurce. After the Spanish–American War ended, Puerto Rico was annexed by the United States as a result of the Treaty of Paris of 1898, ratified on December 10, 1898. Spain had lost its last colony in the western hemisphere and the United States gained imperial strength and global presence. The United States established a military government and appointed Major General Nelson A. Miles the first head of the military government established on the island, acting as both head of the army of occupation and administrator of civil affairs. On January 15, 1899, the military government changed the name of Puerto Rico to "Porto Rico." The Army Appropriation Bill created by an Act of Congress On March 2, 1889 authorized the creation of the first body of native troops in Puerto Rico. On June 30, 1901, the "Porto Rico Provisional Regiment of Infantry" was organized. 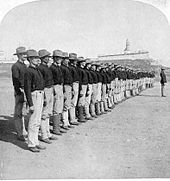 On July 1, 1901, the United States Senate passed a Bill which would require a strict mental and physical examination for those who wanted to join the Regiment. Under the provisions of an act of Congress approved April 23, 1904 and of Circular No. 34, War Department, July 29, 1904, the recruitment of native Puerto Rican civilians to be appointed the grade of second lieutenants for a term of four years, was approved with the condition that they pass the required tests. The "Porto Rico Provisional Regiment of Infantry" was renamed the "Porto Rico Regiment." Camp Las Casas was established in Santurce under the command of Lt. Colonel Orval P. Townshend in 1904. The Porto Rico Regiment, which consisted of two battalions of the former Porto Rico Provisional Regiment of Infantry, was assigned to the camp. On March 21, 1915, Lt. Marxuach, of the Porto Rico Regiment, was the officer of the day at El Morro Castle (Fort San Felipe del Morro). The Odenwald, built in 1903 (not to be confused with the German World War II war ship which carried the same name), was an armed German supply ship which tried to force its way out of the San Juan Bay and deliver supplies to the German submarines waiting in the Atlantic Ocean. Lt. Marxuach gave the order to open fire on the ship from the walls of the fort. Sergeant Encarnacion Correa then manned a machine gun which was located along the wall below La Fortaleza, the governor's residence and fired warning shots at the ship with little effect. Marxuach then fired a shot from a cannon located at the Santa Rosa battery in the upper platform of El Morro, in what is considered to be the first shot of World War I fired by the regular armed forces of the United States against any ship flying the colors of the Central Powers, and it forced the Odenwald to stop and to return to port, where its supplies were confiscated. The Porto Rico Regiment was a segregated unit made up mostly of Puerto Ricans. Puerto Ricans were unaccustomed to the racial segregation policies of the United States which were also implemented in Puerto Rico, and often refused to designate themselves as "white" or "black." This was the case with Antonio Guzman who was assigned to a white regiment, then reassigned to a black regiment at Camp Las Casas. He requested a hearing and argued his case to no avail. Captain Luis R. Esteves, the first Hispanic to graduate from the United States Military Academy at West Point, was sent to Camp Las Casas in Puerto Rico and served as an instructor in the preparation of Puerto Rican Officers for the Regiment. In 1916, the military strength of the Porto Rico Regiment increased with the creation of machine gun and supply companies and the organization of a 3rd battalion. On January 30, 1917, Puerto Ricans Manuel B. Navas, Enrique M. Benitez, Vicente N. Diaz, Andres Lopez, Ramon S Torres, Modesto E. Rodriuez and Ernesto F. Colon were appointed to serve as Second Lieutenants of the Porto Rico Regiment. On March 2, 1917 the U.S. Congress approved the Jones-Shafroth Act, which imposed United States citizenship with limitations upon Puerto Ricans (the Puerto Rican House of Delegates rejected US citizenship), and rendered them immediately subject to be drafted, in order to fight in World War I. On April 6, 1917, the U.S. Congress declared war on Germany and on May 3, 1917, the Regiment recruited 1,969 men, considered at that time as war strength. When the United States entered the war, the U.S. Army Medical Corps believed that they had enough male physicians to cover their needs. Dr. Dolores Piñero applied for a position as a contract surgeon only to be turned down. After writing a letter to the Army Surgeon General in Washington, D.C. explaining her intentions, she received a telegram ordering her to report to Camp Las Casas where she was assigned to the Medical Service Corps of the Army Medical Department. Dr. Piñero became one of the first female doctors to work under contract for the U.S. Army. However, contract physicians had little status within the military. They did not wear uniforms and had little authority. Captain Luis Esteves, instructor and trainer of the Puerto Ricans who served as Officers in the Regiment, helped organize the 23rd Battalion composed solely of Puerto Ricans, for deployment. On May 14, 1917, the Porto Rico Regiment was sent to Panama in defense of the Panama Canal Zone. It is estimated that, while in Panama, 335 Puerto Ricans were wounded by the chemical gas experimentation which the United States conducted as part of its active chemical weapons program. The Regiment returned to Puerto Rico in March 1919 and was renamed the "65th Infantry Regiment" by the Reorganization Act of June 4, 1920. In 1919, Félix Rigau Carrera, also known as El Águila de Sabana Grande (The Eagle from Sabana Grande), made a historical flight out of Camp Las Casas by becoming the first pilot to fly an air mail route. By that time (1919), Camp Las Casas was also being used as an air base. On May 17, 1932, U.S. Congress changed the name of the island from "Porto Rico" back to "Puerto Rico." In 1937 Japan invaded China, and in September 1939 Germany invaded Poland. During that period of time, Puerto Rico's economy was suffering from the consequences of the Great Depression, and unemployment was widespread. This unemployment was one of the reasons that some Puerto Ricans chose to join the Armed Forces. Most of these men were trained in Camp Las Casas, and assigned to the 65th Infantry Regiment. As rumors of war spread, and U.S. involvement appeared more imminent, the 65th Infantry was ordered to intensify its maneuvers. Many of these were carried out at Punta Salinas near the town of Salinas in Puerto Rico. Those who were assigned to the 295th and 296th regiments of the Puerto Rican National Guard received their training at Camp Tortuguero, near the town of Vega Baja. The 65th Infantry Regiment continued to train at Camp Las Casas under the command of Colonel John R. Mendenhall. On November 25, 1943, Colonel Antulio Segarra succeeded Colonel Mendenhall and assumed the command of Puerto Rico's 65th Infantry Regiment, which at the time was conducting security missions in the jungles of Panama. Thus, Segarra became the first Puerto Rican Regular Army officer to command a Regular Army Regiment. On January 1944, the Regiment was embarked for Jackson Barracks in New Orleans and later sent to Fort Eustis in Newport News, Virginia in preparation for overseas deployment to North Africa. After they arrived at Casablanca, they underwent further training. By April 29, 1944, the Regiment had landed in Italy and moved on to Corsica. On June 21, 1944, Segarra was succeeded by Col. Paul G. Daly, in command of the 65th Infantry Regiment. The American participation in the Second World War came to an end in Europe on May 8, 1945 when the western Allies celebrated "V-E Day" (Victory in Europe Day) upon Germany's surrender, and in the Asian theater on August 14, 1945 "V-J Day" (Victory over Japan Day) when the Japanese surrendered by signing the Japanese Instrument of Surrender. On October 27, 1945, the 65th Infantry, which had participated in the battles of Naples–Fogis, Rome–Arno, central Europe, and of the Rhineland, sailed home from France. Arriving at Puerto Rico on November 9, 1945, they were received by the local population as national heroes and given a victorious reception at the Military Terminal of Camp Buchanan. Afterwards, the Regiment returned to Camp Las Casas. After the war the United States reduced its military force and Camp Las Casas closed in 1946. In 1950, a public housing project named Residencial Las Casas was built in the area where the camp once stood. Juan César Cordero Dávila Commanding officer of the 65th Infantry Regiment during the Korean War. Luis R. Esteves Founder of the Puerto Rico National Guard. Virgil R. Miller The 442nd Regimental Combat Team Commander who led the rescue of the "Lost Battalion" during World War II. Carlos Betances Ramirez Only Puerto Rican officer to command an infantry battalion in the Korean War. Antulio Segarra First Puerto Rican Regular Army officer to command a Regular Army regiment. Teófilo Marxuach Ordered the firing of the first shot of World War I, by the armed forces of the United States, against a ship flying the colors of the Central Powers. Fernando E. Rodríguez Vargas Discovered the bacteria which causes dental caries. Pedro Albizu Campos Later became the President of the Puerto Rican Nationalist Party. Agustín Ramos Calero One of the most decorated soldiers in the United States (22 decorations) during World War II. Modesto Cartagena The most decorated Puerto Rican soldier in history. MD Dolores Piñero Among the first female doctors to be contracted by the US Army. Boxer Nero Chen Puerto Rico's first professional boxer. Chen provided boxing instructions to the troops in the camp. ^ a b c Negroni, Héctor Andrés (1992). Historia militar de Puerto Rico (in Spanish). Sociedad Estatal Quinto Centenario. ISBN 978-84-7844-138-9. ^ "CALLS ODENWALD AFFAIR AN ATTACK; Fired On Without Warning Shot, Germany Asserts, Contradicting San Juan Commander. SAYS SHE WAS UNDULY HELD Violated Clearance to Elude Enemy Cruisers That Had Been Warned She Was About to Sail". New York Times. April 7, 1915. Retrieved 2008-08-10. ^ "Jones Act". Library of Congress. Retrieved October 10, 2006. ^ Andrew Glass, Politico: "Puerto Ricans granted U.S. citizenship, March 2, 1917", March 2, 2012. ^ "Puerto Rican Military History". El Boricua. Retrieved 2008-07-15. ^ Ruiz, Bruce C. (November 1, 2002). "Major General Luis Raúl Esteves Völckers". bruceruiz.net. Archived from the original on January 27, 2010. Retrieved 2007-04-01. ^ "Military History". American Veteran's Committee for Puerto Rico Self-Determination. Archived from the original on 2007-07-04. Retrieved 2007-06-27. ^ "Major General Luis Raúl Esteves Völckers". Bell South. November 1, 2002. Archived from the original on January 27, 2010. Retrieved 2010-03-22. ^ "Be Thou at Peace: Virgil Rasmus Miller, Class of 1924" (PDF). Assembly. Association of Graduates, U.S. Military Academy. 28 (2): 132–133. Summer 1969. Archived from the original (PDF) on 2012-02-08. ^ Highlights in the History of U.S. Army Dentistry. See "16 March 1940" entry.